The Jane magnolia variety is a beautiful ornamental tree that can grow up to 10 feet tall. The tree produces a multitude of pink flowers in spring. 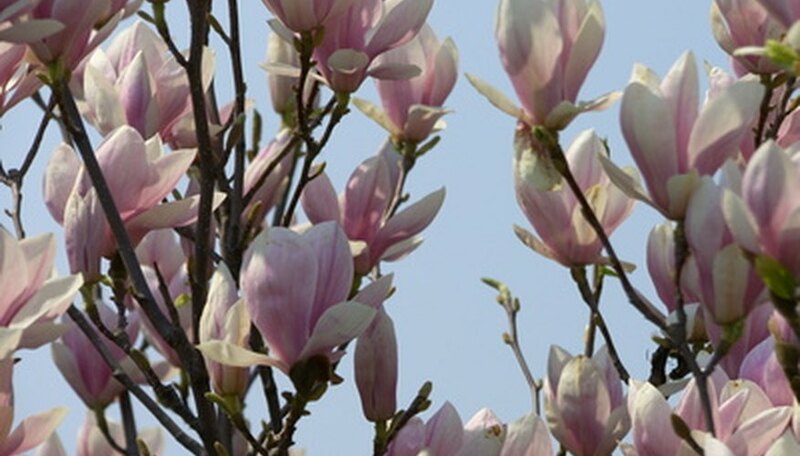 Like all trees and shrubs, the Jane magnolia is susceptible to a number of diseases. According to Edward F. Gilman of the University of Florida, these are normally not serious and only occasionally require the use of chemical treatments. Jane magnolias are susceptible to diseases resulting from both bacteria and fungi. Leaves can be damaged by leaf spot. Shoots, twigs or branches can be vulnerable to fungal cankers. The vascular tissue can be adversely affected by verticillium wilt, caused by soil-borne fungi. The Jane magnolia is also vulnerable to Pseudomonas bacterial blight. Most tree diseases are readily identifiable. Leaf spot, for example, can be easily identified by the presence of brown or black spots on the foliage of the tree. Sometimes the disease will develop to the extent that fungal fruiting bodies will appear on the spots. Cankers can also be readily identified; look for the presence of dead spots in the tree's bark, either on the main trunk or on one of the branches. Verticillium wilt is a little more difficult to identify, but the first sign of the disease is twig dieback. The disease can persist for many years before it kills the tree. Pseudomonas bacterial blight is one of the most difficult to identify because of the difficulty of isolating bacteria for lab analysis; however, its presence can be inferred from the appearance of yellow-lined dark spots on leaves and shoot dieback. Many tree diseases will not permanently damage the plant. Leaf spot will cause the tree to drop the affected foliage, which could have an effect on the appearance of the tree. Fungal cankers will kill branches if left untreated. Verticillium wilt is one of the more severe diseases; it can kill anything from a few branches to an entire tree. Pseudomonas will adversely affect the appearance of various parts of the tree, including leaves, new shoots and even flowers. Frequently leaf spot can be controlled simply by removal and disposal of infected leaves. Cankers can be treated by removal of the affected woody tissue, such as branches or bark. It is important to disinfect the pruning tools between each cut, so as to avoid spreading the fungus. Use a copper-based fungicide if you suspect that the tree is infected with a bacterial blight. This is the only treatment that will control the disease. Fungicide is also an appropriate treatment (in addition to removal of infected leaves) for severe or recurring leaf spot, as well as for fungal cankers. Verticillium wilt is much more difficult to control, and fungicide will not control this disease.